Background: Minimally invasive esophagectomy (MIE) is a technically demanding procedure that requires expertise in advanced laparoscopy and esophageal surgery. Widespread implementation has been hindered by high complication rates and the inability to rapidly demonstrate improved outcomes. 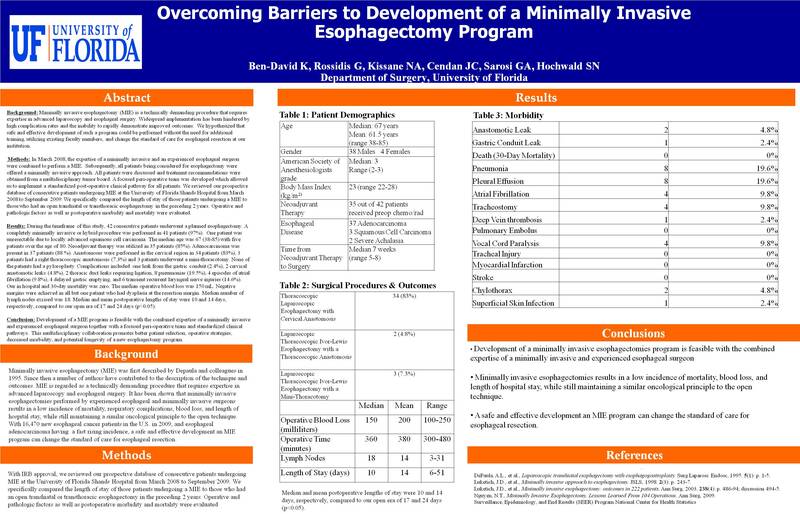 We hypothesized that safe and effective development of such a program could be performed without the need for additional training, utilizing existing faculty members, and change the standard of care for esophageal resection at our institution. Methods: In March 2008, the expertise of a minimally invasive and an experienced esophageal surgeon were combined to perform a MIE. Subsequently, all patients being considered for esophagectomy were offered a minimally invasive approach. All patients were discussed and treatment recommendations were obtained from a multidisciplinary tumor board. A focused peri-operative team was developed which allowed us to implement a standardized post-operative clinical pathway for all patients. After an IRB approval, we reviewed our prospective database of consecutive patients undergoing MIE at the University of Florida Shands Hospital from March 2008 to September 2009. We specifically compared the length of stay of those patients undergoing a MIE to those who had an open transhiatal or transthoracic esophagectomy in the preceding 2 years. Operative and pathologic factors as well as postoperative morbidity and mortality were evaluated. Results: During the timeframe of this study, 42 consecutive patients underwent a planned esophagectomy. A completely minimally invasive or hybrid procedure was performed in 41 patients (97%). One patient was unresectable due to locally advanced squamous cell carcinoma. The median age was 67 (38-85) with five patients over the age of 80. Neoadjuvant therapy was utilized in 35 patients (85%). Adenocarcinoma was present in 37 patients (88 %). Anastomoses were performed in the cervical region in 34 patients (83%), 3 patients had a right thoracoscopic anastomosis (7.3%) and 3 patients underwent a mini-thoracotomy. None of the patients had a pyloroplasty. Complications included one leak from the gastric conduit (2.4%), 2 cervical anastomotic leaks (4.8%), 2 thoracic duct leaks requiring ligation, 8 pneumonias (19.5%), 4 episodes of atrial fibrillation (9.8%), 4 delayed gastric emptying, and 6 transient recurrent laryngeal nerve injuries (14.6%). Our in hospital and 30-day mortality was zero. The median operative blood loss was 150 mL. Negative margins were achieved in all but one patient who had dysplasia at the resection margin. Median number of lymph nodes excised was 18. Median and mean postoperative lengths of stay were 10 and 14 days, respectively, compared to our open era of 17 and 24 days (p<0.05). Conclusion: Development of a MIE program is feasible with the combined expertise of a minimally invasive and experienced esophageal surgeon together with a focused peri-operative team and standardized clinical pathways. This multidisciplinary collaboration promotes better patient selection, operative strategies, decreased morbidity, and potential longevity of a new esophagectomy program.